The dark and suspenseful psychological thriller will debut on Blu-ray in March. 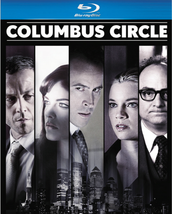 In an early announcement to retailers, Universal Studios is preparing 'Columbus Circle' for Blu-ray on March 6. When a murder mystery next door forces agoraphobic heiress Abigail Clayton (Selma Blair – 'Hellboy,' “Kath and Kim”) to face her terrifying new neighbors, the safe and solitary world she created for herself violently unravels. In order to escape the hounding public and press, Abigail, the famous daughter of a wealthy industrialist, secluded herself in her Manhattan loft on the day she received her enormous inheritance – her eighteenth birthday. Sequestered at the top of the Columbus Circle luxury apartment high-rise, Abigail remained seemingly secure for nearly 20 years until the day her elderly neighbor was suddenly slain. Abigail’s world is now disrupted by strange new neighbors and a police investigation that brings the inquisitive and intrusive NYPD Homicide Detective Frank Giardello (Giovanni Ribisi – 'Contraband,' 'Saving Private Ryan') to her door. Peering anxiously through her peephole each day, Abigail soon learns that the dangerous new tenants, Lillian Hart (Amy Smart – 'The Butterfly Effect,' 'Varsity Blues') and Charles Stratford (Jason Lee – 'Alvin and the Chipmunks: Chip-Wrecked,' “My Name is Earl”), may threaten more than just her privacy. 'Columbus Circle' also stars Emmy® and Golden Globe® Award winner Beau Bridges ('The Descendants,' 'The Fabulous Baker Boys') as Abigail’s only confidant Dr. Raymond Fontaine, and Kevin Pollak ('The Big Year,' 'The Usual Suspects') as 'Columbus Circle’s eccentric concierge. Jason Antoon ('Minority Report,' “No Ordinary Family”), Robert Guillaume (“Benson,” 'Big Fish') and Samm Levine ('Inglourious Basterds,' 'Not Another Teen Movie') also star. The Blu-ray will feature 1080p video, a DTS-HD Master Audio 5.1 soundtrack, and there doesn't appear to be any supplements for this release. Suggested list price for the Blu-ray is $26.98. You can find the latest specs for 'Columbus Circle' linked from our Blu-ray Release Schedule, where it's indexed under March 6.